Here we arrive at the Toll Bar, which was mostly in the occupation of Mr. William Campbell, the gate-keeper. On the pavement were posts forming stiles for pedestrians’ use. The long white gates stretching across the roads were kept locked. The gate looking towards White Lion Square covered the Nottingham, Stanton and Park roads. The South Street gate covered Derby Road. The toll house was on the East side and between the two gates. Mr. W. Campbell had charge of the toll bar for many years. When Belper Street was opened a chain was put across Derby Road just below the present Albert Street, and Mr. Campbell had to unlock it when vehicles came Belper Street way. In eighteenth century England many roads were in very poor condition, and sometimes and on certain routes it was quicker to walk to a nearby town than to go by coach. The road from Nottingham to Ilkeston and on through West Hallam was so narrow in places that it could not accommodate two carriages side by side, and in winter it became almost impassable, deep with standing water and mud. Coal was not getting through to Nottingham as it should. Restricted supply and growing demand meant that the fuel was becoming very expensive, and something had to be done to facilitate its movement. The role of a local Turnpike Trust was to improve and maintain a route and finance this by imposing tolls on travellers and traffic using its road. The toll-gate was where the fees were collected. Thus in 1764 the Nottingham and Ilkeston Turnpike Trust was established by a group of interested local people in those two towns and other places nearby, its original intention to improve the road through Wollaton, Trowell, Ilkeston, Horsley, Kilburn to Belper Lane End, with branches from Ilkeston to Shipley and Heanor, and from Trowell to Bramcote. The ‘interested local people’ included Francis Agard, a miller of Borrowash, and his son William Stringer Agard, Nottingham mill owner Robert Dennison, landowners Richard and John Dodsley Flamstead, Luke Hucknall of Risley and Lemuel Lowe of Bilborough. Squires Mundy and Newdigate were also trustees. (Waterhouse). Parts of the original plan for the turnpike were subsequently altered when, for example, the section from Smalley Common to Belper was excluded, and further changes to its scope were made in 1784, 1804 and 1825. At Ilkeston one toll bar stood across the southern end of South Street while a second one stretched across what was then Nottingham Road, but today we call White Lion Square — from Toll Bar House, in a north-eastern direction. Adeline places the toll house standing between these two toll bars, on the eastern corner of South Street where it joins White Lion Square. It was demolished in 1914. In the 1850’s by the toll-gate was a large board, 6 feet by 2 feet, bearing the date April 13th 1825. It itemised the charges for coaches, gigs, hearses, horses, droves of cows, oxen, calves, sheep, lambs and so on, if they wished to pass through the gate. The signature on the board was that of Hugh Bruce Campbell, Scottish solicitor of the Rope Walk, Nottingham. In 1853 he became the new clerk of the Trust, a post he held until his death in 1863. His position was then taken by Nottingham solicitor Walter Browne. There were numerous disputes over the toll charges, and many of them ended in a court case. For example, in May 1864 horsebreaker Charles Hampson of High Street was charged by toll-collector William Campbell with toll evasion. The case ended up in court … as was usual in Ilkeston!! On horseback, Charles had been on his way to visit wheelwright Joseph Scattergood in Market Street and a court witness claimed to have seen him on the Ilkeston to Nottingham turnpike, turning off South Street into Gladstone Street, just before the pawnbroking establishment of John Moss. The latter street was a very dilapidated private road at that time, not used as a public highway but its surface was partially made up and had houses along part of it. Charles claimed to have never used the turnpike and his evidence convinced the magistrates who dismissed the case. At the same court the horsebreaker also discovered that he had been toll-charged illegally in the past. On five occasions he had taken a horse through the toll-gate to have it shod at the blacksmith’s shop just 20 yards away from the gate, but because it was saddled he had been charged one penny ha’penny each time. He now learned that he was entitled to go a distance of two miles for such an errand, without charge! He also learned that he was not to be compensated with expenses for travelling from Lincoln to attend the court!! The blacksmith to whom Charles was taking his horse might have been William Bell junior at the Travellers’ Rest Inn? At the same court James Dutton was charged with the same offence as Charles. Accompanied by his son, James had come from West Hallam with two carts of coal and had turned off Derby Road at Belper Street to deliver one load at the house of labourer James Lester. The two carts then came out of the street and on to Little Hallam where the Duttons lived, thus by-passing the toll-bar, but toll collector William declared that they had no right to use this route with horse and cart and were merely trying to avoid the toll. After argument over who was in charge of the offending vehicle, William again lost his case. In the following year, William Campbell was facing his nemesis — contractor William Hancock of Kirk Hallam — at Ilkeston Petty Sessions. The toll collector charged the contractor with illegally leaving goods unattended on the Nottingham and Ilkeston turnpike road but unfortunately arrived at court too late to press his case, only to learn the charge had been dismissed. The magistrates told him off — if they were to wait until it suited him to arrive then they might be waiting all day!! What made matters worse for William C was that he now faced a claim from William H for overcharging on the same turnpike. There had been a long-running feud between the two, with the contractor evading the toll at every opportunity, blatantly baiting William C and making his life a misery. The toll-collector was spitting nails and although he might have overcharged, it was no more than the other William H deserved. The magistrates disagreed however and the matter was settled with both sharing the costs. October 31st 1874 marked the end of the 111-year history of the Nottingham and Ilkeston Turnpike Trust. “Ilkeston Toll-Bar is no more! The Turnpike Trust expired on Saturday night last and on Sunday morning scarcely a stick of the bar was to be seen – gates, and all the chief posts, having taken a moonlight flight”. Quick to spot a bargain, nearby resident Ralph Shaw had purchased the two now redundant toll-gates ‘with all their appurtenances’. Tolls were collected as usual during the day but at about nine o’clock in the evening ‘demolition’ began, and by half past 10 both gates had been taken, along with the pallisading on either side. Following the Sunday rest-day, the removals continued on Monday when ‘the last vestige of the bar’ disappeared. And the Pioneer continued its celebration; “the extinction of the tolls, and the removal of the bar, are subjects of general gratification to the inhabitants of Ilkeston and the neighbouring villages, and will tend greatly to improve the value of property in South-street and the Nottingham-road, and open the way to several improvements in the locality”. Rival newspaper, the Ilkeston Telegraph, noted one, more immediate, benefit. “The gatehouse is being taken down for the purposes of reducing the curve, and otherwise improving the road”. The good mood was not to last however. Three weeks later and the Pioneer had found something to criticise, and once more the Local Board was in its line of fire. “Only a white-washed wall now remains – a solitary remnant – to betoken to the stranger where once stood the Ilkeston Toll-bar. But it appears that the disappearance of one nuisance leads to the creation of another; for the road has been so hacked up that a shower of rain makes it into such a puddle that pedestrians are not able to cross except by wading a considerable depth in mud. If the Local Board would see to this they would be doing good services”. Had ‘the last vestiges’ disappeared? In 1910 two old posts which held the toll-gate could still be seen on at the south end of South Street, between Shaw’s butcher’s shop and Shaw’s saddler’s shop. The Pioneer (1932) records that the last relic of the old toll gate was one of the posts which stood alone for some time at the bottom of South Street, on the right-hand side in the direction of Nottingham and Derby. Shortly after the demise of the toll bar, in May 1875, William Campbell was appointed Inspector of Nuisances for the Local Board, for one year, at an annual salary of £60. (William Campbell) was a tailor and plied his business at home. We have met William Campbell at Carrier’s Buildings alias Pleasant Place further along South Street towards the Market Place. He was the son of tailor William senior and Ann (nee Gregory) while his second wife Sally Elizabeth (nee Outram) was the eldest daughter of land surveyor, maltster and publican John and Lucy (nee Fletcher). Mrs. Campbell died, leaving him with two daughters, Lucy and Annie. William’s wife Sally Elizabeth died in September 1865, aged 49. — The couple’s first child, William Fletcher Campbell, had died aged seven months when accidentally scalded by an overturned pancheon of boiling herb beer. At the time he was being minded by a ‘nurse’, a girl about five years old. — Lucy married Mr. Stephen Barnes. Lucy was their second child and married Stephen Barnes, blacksmith son of Elias and Hannah (nee Mason) in March 1881. 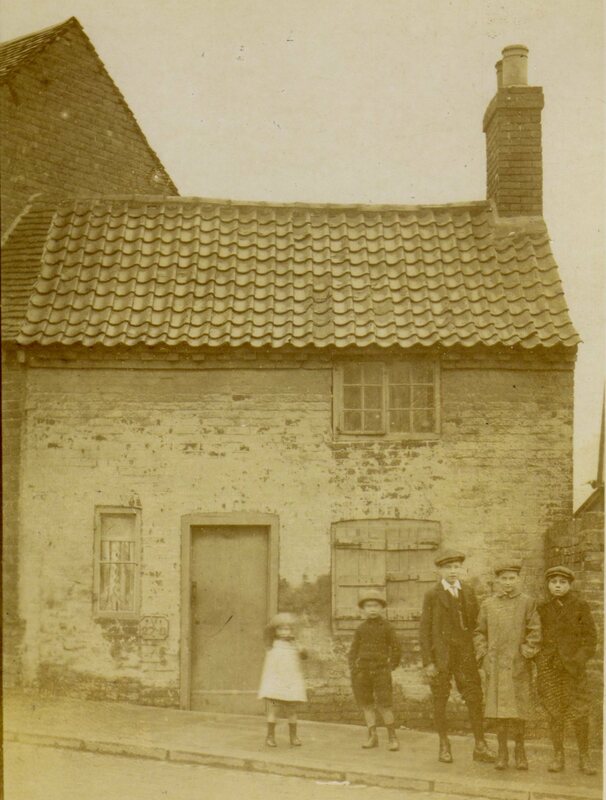 The Barnes family arrived from the Gedling area of Nottingham in the early 1850’s and when Lucy married into it she joined the household in Stanton Road. However the following year was to prove a very sad one for the Barnes family. On February 18th 1882 Lucy gave birth to a daughter but then died of puerperal fever on March 4th followed by her unnamed daughter on March 12th. And on December 10th Stephen died of meningitis, aged 37. All were buried close together in the General Cemetery in Stanton Road. At her death, Lucy’s father informed the readers of the Advertiser that his daughter had been born, been married and died in the month of March. He also expressed his thanks to all in the neighbourhood for lowering the blinds of their dwellings until after her funeral. — Annie was in domestic service. Daughter Annie was for many years a domestic servant in the household of Francis Sudbury, hosiery and glove manufacturer, at first in Market Street and later at Field House. And it was in Market Street that her illegitimate son George Bell Campbell, was born in February 1873. The latter was present when his grandfather William Campbell died in Weaver Row on January 25th 1890, aged 85. — Daughter Elizabeth, twin of Annie, died of scarlatina in February 1858, aged four years. Before her marriage to William Campbell, Sarah Elizabeth Outram gave birth to her illegitimate son William in March 1835. 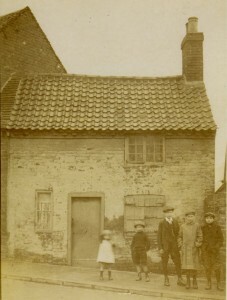 He appears on the 1841 census living with his mother and other members of their family, at Nottingham Road. He was not to appear again. In September 1842, while riding on a cart, William fell off and was fatally crushed by the cart’s wheel. The former Toll Bar Cottage at the junction of White Lion Square (to the right) and South Street (to the left). We are at Toll Bar corner.